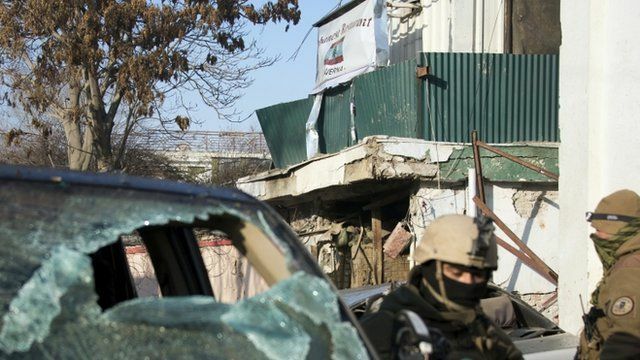 Security probe after Kabul attack Jump to media player A number of Afghan officials have been suspended as an investigation is carried out into a suicide bomb and gun attack in Kabul that killed 21 people. UN 'shocked' by Kabul attack Jump to media player A senior IMF official and four UN employees were among 21 people killed in a suicide bomb and gun attack on a restaurant in Kabul, officials say. A number of Afghan officials have been suspended as an investigation is carried out into a suicide bomb and gun attack in Kabul that killed 21 people. The Taliban has admitted targeting a busy Lebanese restaurant, leaving 13 foreigners and eight Afghans dead. Caroline Wyatt reports from Kabul.